I hated dressing up as a kid. Jeans have been my wardrobe staple for as long as I can remember. B, on the other hand, has probably only worn jeans a handful of times in her life. She is actually the one who’s helped me realize that you can effortlessly wear skirts and casual dresses around town, on the playground, or kickin’ around the house. Skirts don’t have to be fussy. You can get them dirty. Run in them. Bike in them. Bonus: They’re oh-so-breezy in hot weather. 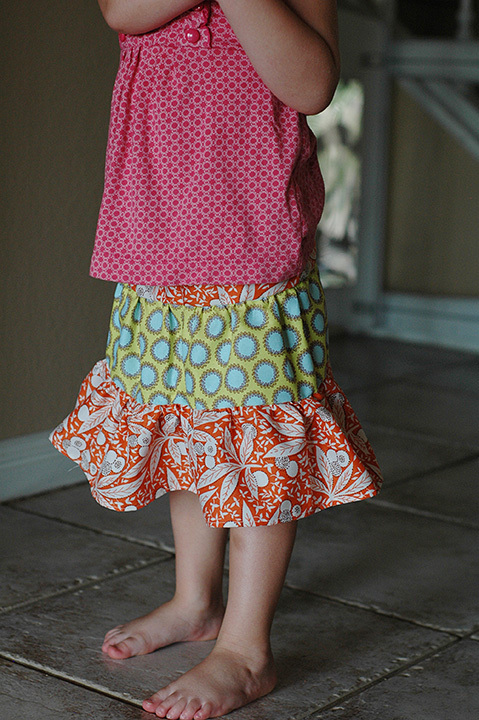 Before school started in August, B asked me to sew some skirts for her. I’d never tried it, but found a couple of tutorials for layered skirts that looked pretty simple. The first skirt is made from fabric of my choosing. The second skirt is fabric that B chose. I really love that B was so involved in the project, picking out fabrics and helping me cut the pieces. She told everyone at school that she made the skirts herself 🙂 Maybe one day soon, she will. 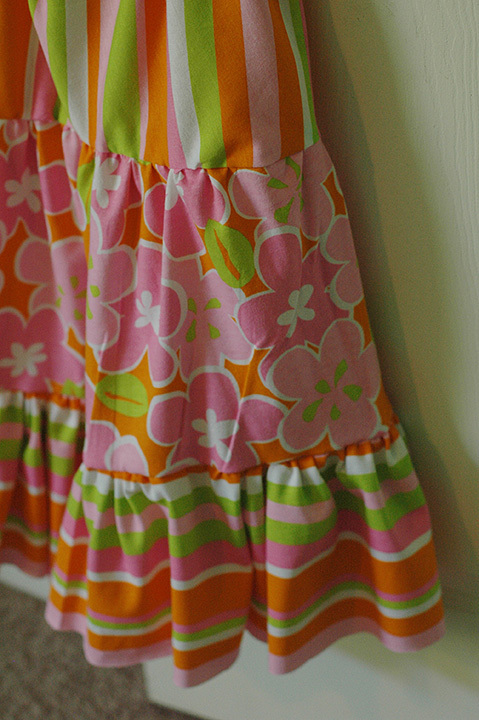 HOW TO MAKE YOUR OWN: If you’re familiar with sewing, the basic idea is this: Cut strips of fabric that are twice as long as your daughter’s waist. If you want it more frilly, cut longer strips. Less frilly, shorter strips. But a safe minimum is 1 1/2 times the length of her waist. 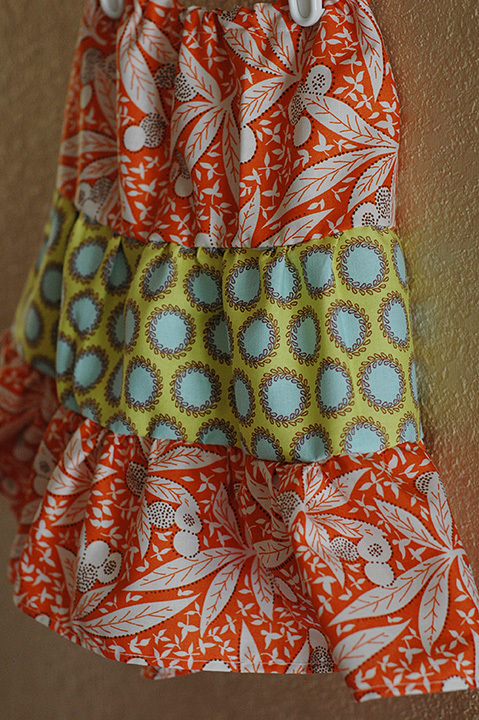 Sew a basting stitch at the top of each fabric strip (tier of the skirt). Pull the basting stitch to gather the fabric, then sew the tiers together (lay the right sides together, and sew a zigzag stitch along the inside of the basting stitch to maintain the gathers). Once the tiers are all assembled, fold the skirt in half, right sides together and sew up the seam. Then finish the hem. The waistband is just 3/4 inch elastic. You can see how I sew a waistband HERE. If you’re like WAH? Basting stitch? HUH? Never fear. You can follow some easy tutorials HERE and HERE.